The Crown Desolventizer is a vertically oriented cylinder with multiple trays that are steam, hot water or oil heated. The desolventizer employs indirect heat transfer to desolventize ethanol, hexane or other solvent-wet products on a low-cost basis. When the product allows, we can also introduce steam into the desolventizer and combine direct and indirect heat transfer, thus reducing the overall equipment size. 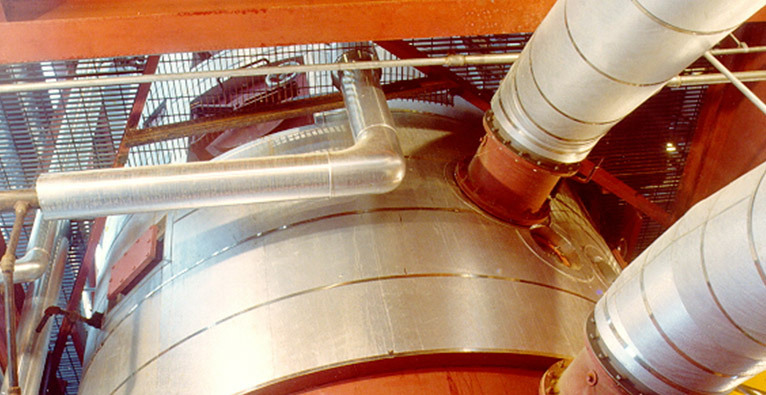 The product discharges the desolventizer at the boiling point of the solvent and is somewhat wet when steam is sparged into the product to strip away residual solvent. The Dryer-Cooler (DC) is a direct-contact dryer that uses the heat and water in the product to dry and simultaneously cool the product with minimal air. The DC is a counter-current semi-fluidized bed dryer set up in a vertical, multiple-tray arrangement similar to the Crown Desolventizer.